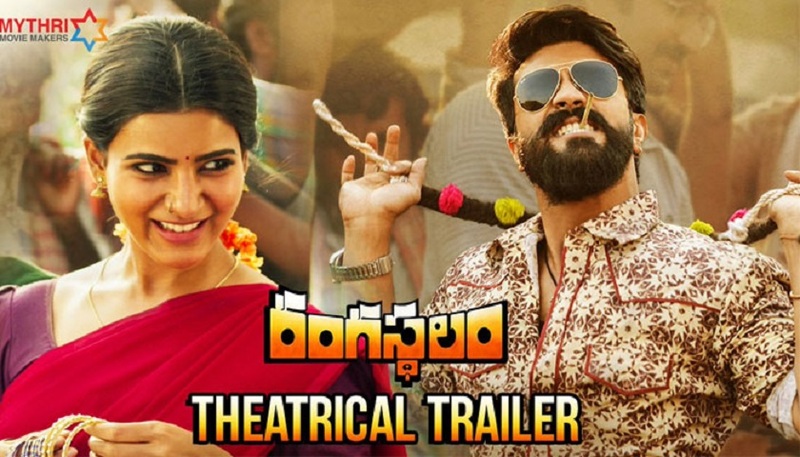 Mega Power Star RamCharan Tej, Samantha, Sukumar and Devi Sri Prasad combination Latest Flick ‘Rangasthalam Movie’ Theatrical Trailer released on Major Telugu Festival and Telugu News Year ‘Ugadi’. The Rangasthalam Theatrical Trailer looks much promising that the movie story resembles a 1980’s village back drop movie where the story revolves around ‘Rangasthalam’ named village. Where Presidents, Jameendars and Sarpanch’s ruling the villages where all things are under their control with unanimously. But the villagers looks for monotony that people should survive and live happily. Mega Power Star RamCharan playing as Chitti Babu who is uneducated Engineer in the village who helps the villagers in all they need. Samantha is playing as Farmer girl in the village and fall in love with Ramcharan. Aadi Pinisetty is playing as Kumar Babu who is well educated and working as under government authority. Aadi is playing as RamCharan’s brother role in this movie. Jagapathi Babu playing as President who is an antagonist in the village. Prakash raj playing a lead role as communist in this flick.